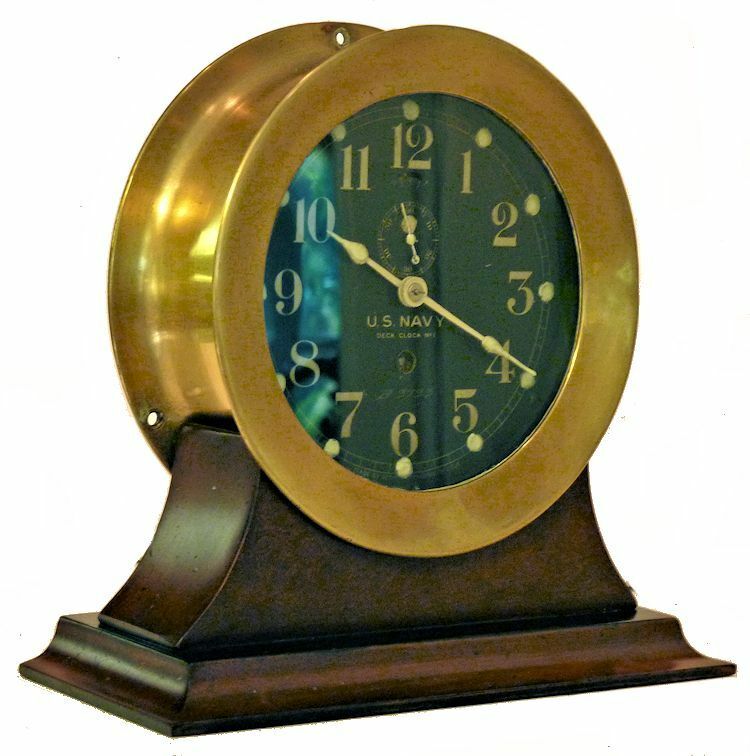 This Unique Navy Deck Clock Has Been Sold. Thank you! Seth Thomas, America's oldest clock maker started operations in 1813. 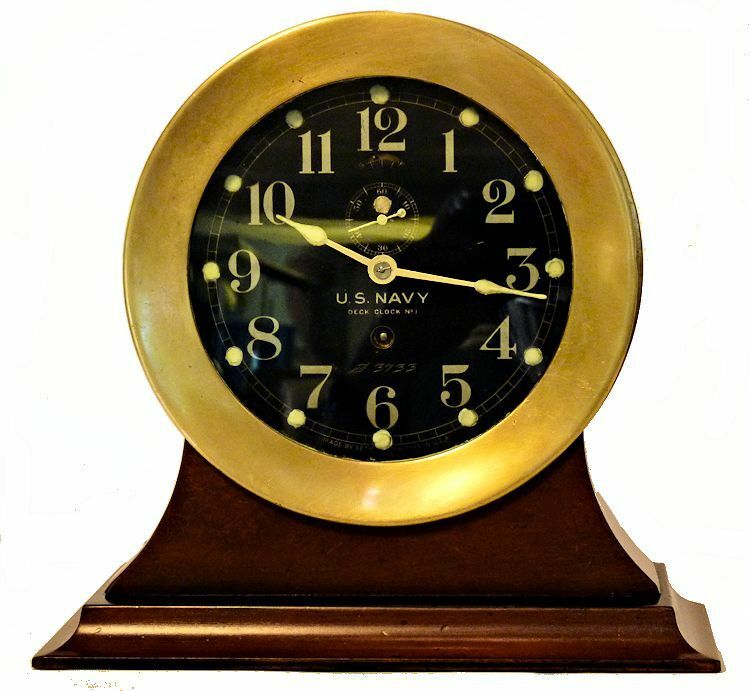 Their Nautical clocks first appeared in the 1860's and were the official US Navy Ships' clock for almost 100 years. 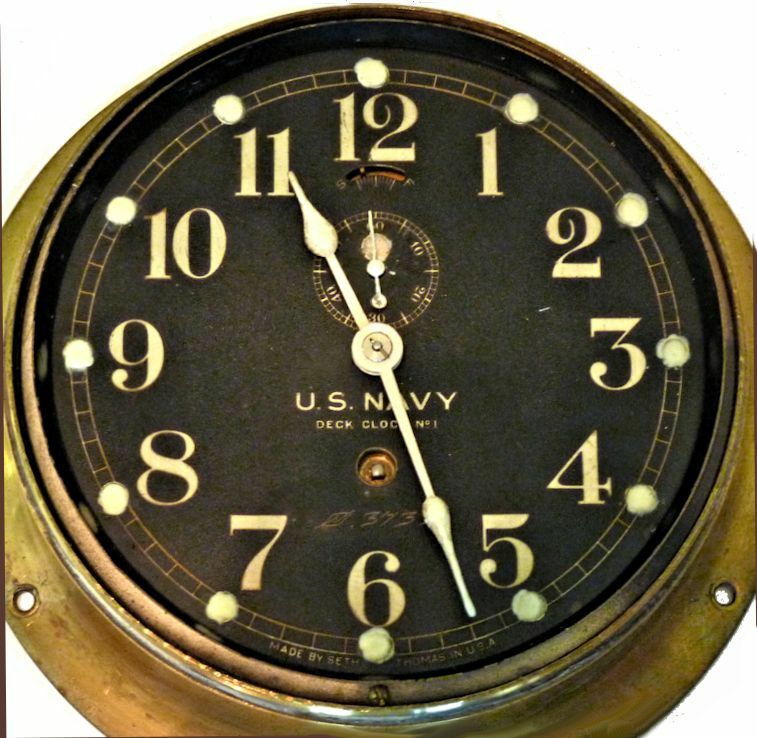 Presented is a extremely rare, antique eight day, time only, US Navy Deck Clock No. 1 clock with a 6" black face that was made by Seth Thomas. It is engraved with the Naval Observatory cartouche directly below the winding arbor and the NO number, 3733. A similar example is pictured on page 781 of Tran Duy Ly's, Seth Thomas Clocks & Movements, Third Edition, Volume 2. Based on the NO number and Duy Ly's reference we believe this clock may have been made as early as 1902. It has a 6 inch, flat black dial with silver screened Arabic numerals and Arial fonts. The spade hands are painted white with the points painted with old radium coating. The circular dots below the numbers have radium for night use, but that has since become inactive. Radium is radioactive material and its use was suspended. The face is in near perfect condition. The forged brass case is dull from an earlier cleaning and polishing. It is free of pits and only has a few which are hardly noticeable. We believe it has an early version of the Ships Lever, 7 Jewel, 8 Day movement from which it evolved. 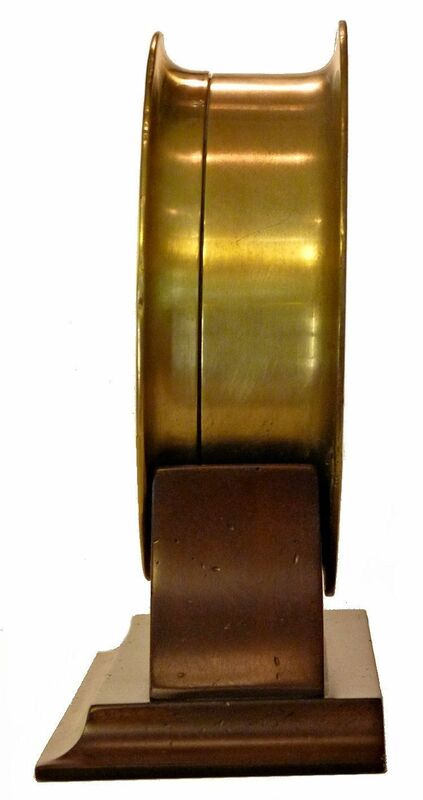 The mechanism is housed in a very heavy, forged bronze deep case with screw on bezel which has a maximum diameter of 7 3/4" at the rear, and is 4" deep. It is keeping exceptional time right in step with the National Bureau of Standards time and the equal of a chronometer. The period style tabletop stand is included at no additional charge. CONDITION: This fine clock is in remarkable condition and shows only the normal patina of age. 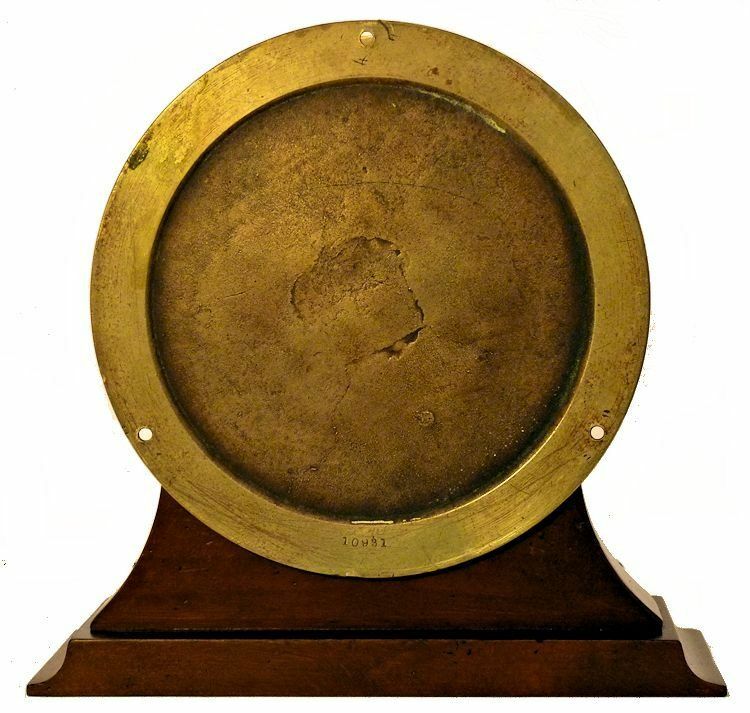 The case shows some minor marks of handling. The clock was serviced by its last prior owner, a collector of quality time pieces and the movement is keeping very good time. Since it is over 110 years old, we recommend it be wound about every four days for best timekeeping. SPECIFICATIONS: Forged bronze case with screw on bezel. The six inch face has a five inch viewable area on the black dial. The spade hands painted white with radium tips. The Arabic numerals and Arial lettering are painted silver. The precision made 8 day movement likely has 7 jewels, and a compensated balance wheel and Breguet hair spring. Weight 8 lbs. 8 3/4 oz. 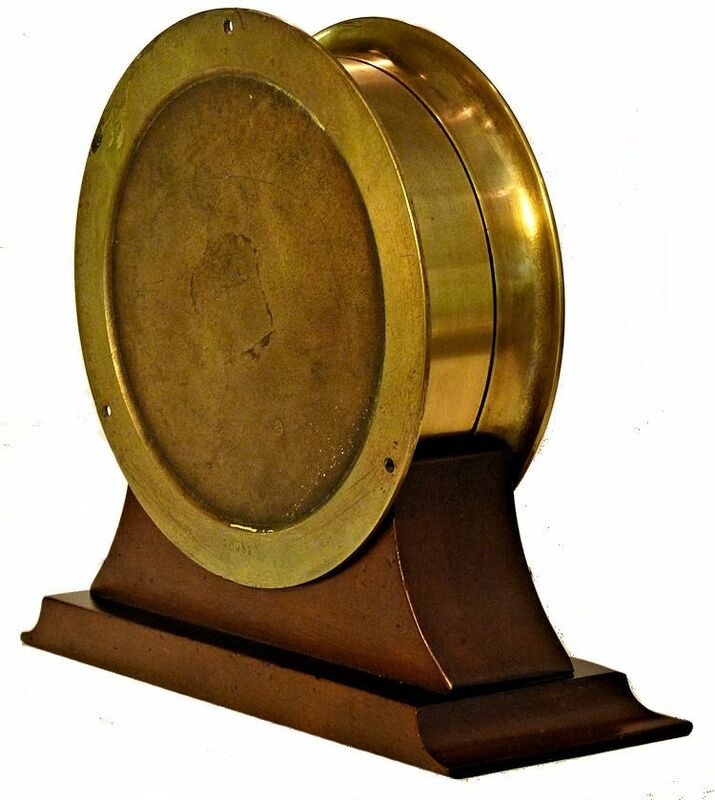 This early Navy clock has likely served in three major wars and other conflicts. It makes a perfect gift or as an addition for your den wall or in a collection.